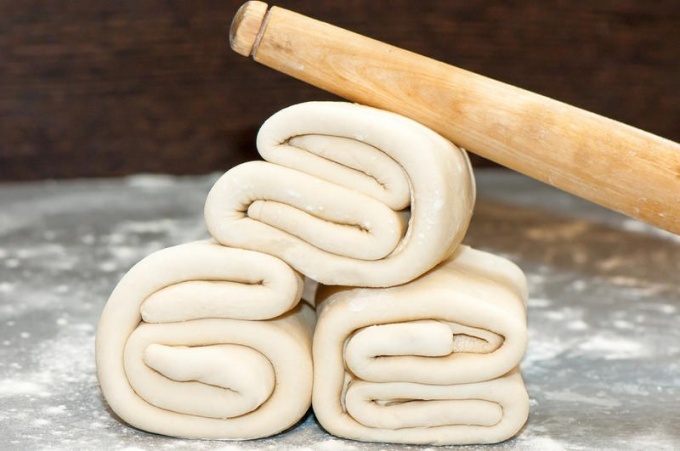 Frozen puff pastry can be the basis for a quick and delicious pastries, as hearty and sweet. Experiment with the stuffing and shape of products, inventing new and interesting combinations. Prepare the original version of the famous French pastries, adding fat puff pastry creamy almond cream. Scald the almonds with boiling water, remove the skin and chop the nuts in a blender. Whisk butter with egg yolks and sugar until complete dissolution of crystals. Add the cream, flour, brandy and ground almonds. Continue whipping the cream until smooth. Defrosted the dough, roll the pastry out in a circle. Cut it into 6 segments. Smear the almond cream triangles and roll from wide end to narrow, giving the product the shape of a croissant. Lay the workpiece on a greased flour the baking sheet, brush each piece with beaten egg with a couple drops of vanilla essence. Bake in the oven preheated to 220оС until Golden brown. Instead of almond cream croissants can be filled with thinly rolled marzipan. On the basis of puff pastry you can prepare a delicious crispy pizza. Defrost the dough, roll it into the reservoir and place on a baking sheet, greased. Olives cut into slices, mushrooms into thin slices and ham strips. Grease the dough with tomato sauce spread on it mozzarella, cut into small cubes. On top lay the ham, olives and mushrooms. Bake the pizza in a preheated oven at 220оС. Before serving, sprinkle the cakes with pepper and cut into portions. Such crescents are a great alternative to the usual sandwiches. They can be served for Breakfast or dinner and also to take along for a hearty snack. Defrost the dough and roll it into a thin layer on the table sprinkled with flour. Cut the dough into squares, each split diagonally into 2 triangles. Chop the garlic, mix it with cottage cheese and greens. Alternative mix cottage cheese with garlic - any soft cheese. On each triangle place a portion of cheese mixture, spread it with a knife. Place on top of the sausage and carefully wrap the dough, giving the product the form of a Crescent. Arrange puffs on a baking sheet, brush with beaten egg and sprinkle with sesame seeds. Bake products at a temperature of 200oC until Golden brown. Serve crescents with a crisp green salad.